Since there are more and more used Nissan LEAFs for sale, one wonders how the residual market value of LEAF EVs are determined. 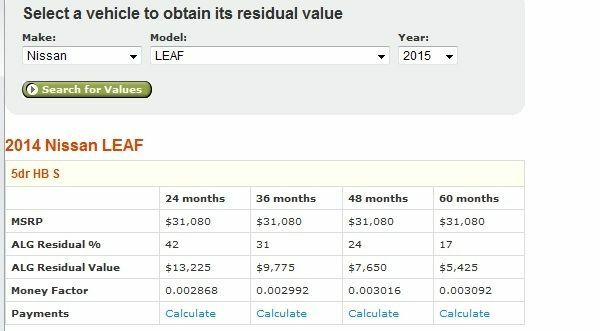 In this picture you see the residual value of 2014 Nissan LEAF 5dr HB S, estimated by Cars.com. But there are issues related to battery replacement and battery life, which I don't know if are included while calculating the 2014 LEAF's residual value. I asked the question to some Nissan LEAF owners and here is what they commented. Thomas Crummett, who earlier blogged on how he uses his Nissan LEAF's trip computer, writes that residual value is the amount the financing company owes on the vehicle. If you get a 3-year lease with $0 down and $100/mo, the residual will be the sale value - $3600. Or, more accurately, it would be the purchased price minus all payments. Often this is over KBB/resale value, and with Electric Vehicles, it's often off by thousands. However, one problem, that LEAF drivers were pointing out related to Nissan LEAF's residual value is the constantly improving battery technology. In general, a big unknown when it comes to resale value of electric vehicles is battery degradation and the cost of replacing the battery pack. "Due to the constantly improving battery technology and the EV technology in general, the LEAF had never held value since its original release," writes Melina Hristova, referring to "lizard battery" to address higher temperature climates tolerance as an example. However, we have to point that Nissan has addressed this problem with aggressive pricing of Nissan LEAF replacement batteries. How well it's working, I don't know. Victor Sfo who lives in San Franciso, says he never had an overheating issue with his LEAF's battery. Crummett replied back and explained that any time it's over ~90, your battery will suffer. "Just because it hasn't immediately failed or significantly degraded does not mean you wouldn't benefit from an improved chemistry. Definitely much more significant in areas like Arizona," Crummett writes. Hristova replied back and wrote that there was a reason Nissan decided to improve the battery chemistry. "If you are down to 9 bars and getting only 50 miles out of a full charge, the adjusted warranty means nothing. You are waiting like many to lose that 4th bar, so you can claim warranty replacement, and struggle to make your commutes and rounds like many. Not to mention, pre-owned LEAFS with even one missing bar are sitting unsold at dealerships for months, no matter how low the price is, while the value of the car continue to drop almost weekly," she explains. Interestingly, Luke Ottaway, at the time was a fellow in automotive engineering at the Clemson University International Center for Automotive Research, says that EV Battery degradation in extreme temperatures might not be as bad as AAA says. Brian Henderson redirects the conversation pointing out how important the market conditions are when determining anything's residual value. He correctly writes that the "residual value depends on the market conditions at the time the lease was initialed. Like interest rates on a loan; they vary based on a number of market factors … no one magical formula." David Laur agrees with him saying "Brian is right. The value of anything is what people are willing to pay for such item. With other incentives available for new LEAFs, older ones can be tough to sell. In most cases, used LEAFs can be several thousand less than the residual on the lease. If you are in a lease and its about to end and you cannot negotiate a lower buyout, then let them take it and go buy a used one. You will likely save a ton." Have you recently tried to sell your Nissan LEAF or buy a used one? Our 2011 went back to Nissan's leasing company last year. The residual was about $16k. It had all its bars and had a babied battery but still managed to lose 10-15% range. I offered the leasing company $11k but they said the original residual or return it. It went back and we leased a RAV4EV.